I am in Gao, Mali, as the only woman member of a British-sponsored interdisciplinary team studying night migration of grasshoppers. From the records, vast numbers of them seem to appear from nowhere, eat what meager patches of vegetation can be found and thereby add to desertification. Where do they come from? How do they get there? How can there be so many so suddenly? We flew to Niamey in Niger and for two days we traveled north in land rovers, crossing into Mali, following a rough road that follows the River Niger upstream. We left some of our group at Daoga and will head north from Gao, away from the river and up the wide, stony, Tilemsi valley. The two teams will camp 50 miles apart across the InterTropical Convergence Zone (ITCZ), an area of low pressure that forms where the Northeast Trade Winds meet the Southeast Trade Winds near the earth’s equator. As these winds converge, they force moist air upward. This causes water vapor to condense, or be “squeezed” out, as the air cools and rises, resulting in rainfall. In desert areas, the InterTropical Convergence Zone, which moves north in summer and south in winter, is a place where grasshoppers may find plants, at least some times, some years. Our food for the month was purchased in England and shipped to Niamey. Our water drums are filled in Gao, and we must get used to managing in camp with little more than a gallon per day per person. That afternoon in Gao, six of us sat around a wooden table covered with green plastic cloth. No one wants any of the dark-coloured food in the glass cabinet, which is unidentifiable, though some of it is probably goat meat. A door with torn screen blows open and shut. Through dusty glass I see two bearded men in long white robes squatting in the heat under a neem tree. One draws shapes in the dirt with a stick, his robe folded up over his head. The other gazes into the distance, cloth drawn tightly round his thighs. They talk little and I wonder how they manage to squat for so long without moving. Here in the hot afternoon café we daren’t drink the water but instead drink warm, sweet, very fizzy, very brilliant orange-coloured Fanta. It is good to sit still after rattling along for two days in a Land Rover, but conversation lags. Joe, who is fluent in French, talks briefly with the waiter. There was a sandstorm two days ago, drought continues, the best well has become contaminated with grasshopper corpses. We hear the mid-afternoon call to prayers from the nearby mosque, and I realize that we have been in the café for a long time. Three men go by, one in long red robes, the other two in white. They prod a single Zebu bull ahead of them. “Fulani,” murmurs George, but they have gone by before I have time to register their faces. That I miss some details is unimportant. That I have no watch doesn’t seem to matter. That time passes so idly seems reasonable. Reg and I are silent. We are partners in every sense. I know he thinks as I do, of the sights of the past two days, the villages of Ayoru, Tillaberi, and Ansongo, with their low mud houses and narrow streets full of people and animals in the cool of the morning, classic barren desert beside the wide brown river Niger, large decorated boats being loaded with grain to be paddled or motored downstream to bigger towns. There is a wide alluvial strip between barren desert and water that is almost luminous-green with rice, turning the adjacent red sand dunes into a delusion. Two men on camels pass by in the street. They are Touareg nomads, draped from head to foot in dark blue cloth. Only the top halves of their faces are visible under turbans, faces also blue from the dye of the cloth. I learn that for centuries, these people herded camels and goats across the Saharan plains, leading a hard but independent existence. When the French colonized the region in the late 1800s, the Touareg put up a fierce but unsuccessful resistance. Then, with independence in the 1950s, the Touareg were parceled out among the newly created countries, and their nomadic existence restricted. However, they sit erect and silent on their camels and we will see more of them in the camp at Tin Aouker. The sun is low. Dust-laden rays of sunlight hit the edge of the tablecloth, highlighting the feeding and copulating of flies. I notice that one of the flies has only five legs but is in no way hindered in its activities. If anything, it seems to get more matings than the others. As I watch them they hang their heads when extending probosces with spongy tips, and note how long the sponges engage in licking old food spots on the plastic. Flies have been so engaged for almost one hundred million years, and I become conscious of time or perhaps timelessness here, so far from everything I know. When we finally arrived at our campsite at Tin Aouker in the Tilemsi Valley it was almost dark. Reg put up our two-man tent by starlight while I struggled with our camp cots and nets outside the tent. We all got our water rations and turned in early, exhausted from the rough journey. The hot day turned into a cool night and we needed blankets out under the stars where the donkeys startled the midnight hours with braying and we woke early with the dawn. Don made his little camp some distance from the rest of us, saying, “I need distance.” When he rose next morning he found his cot beside a skeleton emerging from the desert sand, and it wasn’t long before several Touareg men arrived, gesturing and shouting among us. We had accidentally camped on an old burial ground with some special significance. The skeleton was to be dug up and reburied. We had to move camp. Don was one of those people to whom things happen. The next night the nomads brought him back after he lost his way when he went off in the dunes to pee. At the new campsite, Nick picked up a stone arrowhead and we all marveled at the quality of the point, the details of the tiny notches. Then George found a stone axe head. In the next hour or so we all had found stone tools and we forgot grasshoppers in our excitement. The tools were scattered all around on the stony slopes of a low hill, exposed I imagine, as sand had been blown from the surface. None of us thought about the archeological value of the site with tools in such abundance, and it was twenty years before Mali established laws restricting export of such items. My arrowheads are between one and two inches long. Some are narrow with very fine lateral serrations and sharp points. At the base they have hafts that must have fitted into wooden handles, so that they look like very symmetrical miniature pine trees. One is broad, with five large serrations along each edge. Another has rounded sides and a particularly sharp point. The roughest looking has sharp smooth sides and is almost completely flat. Each, I suppose, must have had a different use. The fine “axe heads” were probably scrapers and hand held, varying from about an inch long and even smaller in width, to about two inches square, polished and rounded with perfect edges. No signs of chopping or flaking to make the edge, making them Neolithic, at the earliest probably between four and six thousand years old. I hold an axe head. It fits exactly in my palm. Each of my fingers runs over the silky-flat surface, as I imagine a dark hand long ago that may have treasured such a tool. I think about the hands that held the axe then and what thoughts may have engaged the man in long hours spent grinding and polishing. Was there joy in making and holding this thing? Was it the Swiss army knife of those times? And why was there no sign of wear on its sharp edge? Had he dropped it out of his woven bag as he ran from some enemy? Was it kept for prestige? Had it been used in a burial? Did the maker wonder about the meaning of human life? What tribal identity, myth, and ritual gave order to his days? What have we inherited from those distant days in our needs for aesthetic detail, quality tools, mythical explanations of who we are and why we are here? George in Daoga was on the two-way radio talking to Nick up with us in Tin Aouker. Those of us with daytime jobs were sitting around the table under the mess canopy, chatting about the day’s work. The temperature had finally fallen to something comfortable as we drank tea and picked at the broken shortbread from a big square tin. “Interesting that all the females are immature – no sign of eggs in ovarioles,” mentions Don, who had been dissecting insects under the microscope in the lab tent. “Yes, that’s what I got on the transects around here today,” said Nick. As darkness fell, the radar team was busy in the truck, monitoring activity in the air above on an oscilloscope. Insects appeared as white dots and a group of them at similar altitude showed as a circle of white dots. Groups at greater altitude created circles with larger diameters. With many insects in layers the screen became a mass of concentric circles, but when the air was dense with them the screen was entirely white. Dense in this context meant a couple of insects in one hundred meters cubed. Our mission was to understand the night-time migration of pest grasshoppers that were adding to the desertification of the Sahel in West Africa. Life for the nomads is hard enough in such a desert, without the added problem of competition from millions of these grass-devouring insects. They were inconspicuous and cryptic in the daytime, but with conventional scanning radar we could see them at night, and measure the density and flight speed. With upward looking radar we could detect the orientation and wing beat frequency of the insects used to characterize each species. We had build a plastic-lined pool in the sand that we filled with water and lit at night and we obtained additional evidence for species flying not just from ground surveys in the daytime but from collections of insects that dropped down into the watery light trap at night. The meteorologists provided measurements of wind speed and direction at different elevations. The hypothesis was that the grasshoppers were programmed to fly downwind and thus pitch up at the InterTropical Convergence Zone, the best place to find food. The masses of individuals flying at night were mixtures of species all doing the same thing. They flew before they were reproductively mature, presumably banking on getting food and then settling down to eat, mate and develop eggs in the only likely places to find vegetation. The team of people worked well together – radar scientists, electronics technicians, meteorologists, ecologists, insect physiologists, and Nick, the taxonomist and trickster. There were fourteen of us plus the Malian locust control man, Coulibali, and our Malian cook, Ibrahim. At sunset, with the day jobs done and the night jobs yet to begin we all sat down together to report the highlights of the day; grasshopper survey counts, finds of stone tools, Touareg activities. Surveys sometimes took us close to a Touareg camp. We could hear radios with occasional French words emerging from crackle. Radios are typical gifts from Europeans or Americans crossing the Sahara, running out of water and being saved by nomads. The batteries run low, but no one seems to mind that hearing the words or music is impossible; the volume is kept up just the same. In the distance was a block of windowless rooms built by the French in a vain attempt to provide a permanent township. In the other direction, were heat mirages over the stony hills. We saw it coming. A distant brown blur across the rocks and dunes of the desert. And the wind is rising. “Quick,” yelled Nick, “Get the tents down, chaps.” We set to as the brown mass came toward us. We flattened every tent over its contents and held it down with rocks or whatever heavy objects we could find. We did the mess tent last, and that was difficult with the wind blowing hard and the first sand blowing in our faces. John and Joe covered the radar dishes and tightly closed the equipment truck containing the generator and oscilloscopes. Then we all got into the Land Rovers, rolled up the windows, locked the doors and waited. For three hours we could see almost nothing but brown as the sand and dust whipped across the desert, sanded the paint on anything left exposed, scratched the glass on the windscreen. The vehicles rocked. The edges of tents flapped free from their anchors. The sounds were eerie with whines and none of us spoke. We listened and watched the violence, and wondered how long. I wondered how the Touareg managed sand storms and what on earth the grasshoppers did. Surely the sand would wear away the waterproofing of their cuticles. The air calmed down and the sand settled. The storm was over by late afternoon and we were able to put things in order again before dark. And that was good because sunset involved a ritual that every single one of us valued above all other things in this Mali camp. The generator, brought to run electronic equipment for the nighttime radar work, ran a small refrigerator during the day. It was just big enough to hold one small bottle of beer for each researcher, and every evening at sunset we emptied the day’s ration with such smiles and goodwill that I am sure, after a long day of piercing sunshine, shade temperatures above 400C, a monotony of warm water, salty soup and hot tea at predetermined intervals, that beer was critically important to the success and enjoyment of the trip. I started to think of that treat quite early in the day, and by mid afternoon could think of little else. The faces at sunset when Nick called, “OK chaps,” told me I was not alone. The day of the sand storm happened to be Sunday and Don, who had thought out the whole menu for all these people for weeks and weeks in the desert, had decided that Sunday should involve some kind of treat. His choices overall had been excellent. We had muesli with milk made up from powder for breakfast, together with lots of tea. For lunch we had soup made up from powder, some canned meat or sardines, Ibrahim’s pan bread, canned or dried fruit and lots of tea. Dinner varied. But usually we ate stew from dried meat, scrambled eggs made from powder, rice dishes from packets, cheese, jelly, and lots of tea. On Sundays a big can of Dundee fruitcake was opened and the fruitcakes marked the passing weeks. And so, on the day of the sand storm, after sunset beer, and dinner, we sat around the trestle table in the mess tent with lamps burning, eating fruitcake, and telling tales of life in the desert. From time to time we heard the light splash of an insect hitting the water at the light trap. I live in the Sonoran Desert in southern Arizona but by the standards of the Sahara it is hardly a desert, with its winter and summer rain and rich flora. Where we worked in Mali there were just three plant species and those scarce and restricted to wadis, the spots that are slightly lower, where water collects a little when it rains. It was not always so. Neolithic humans lived here in abundance. But it is the nature of deserts to make us aware of time, of the past, and of endurance. It is the nature of deserts to trigger contemplation of who we are and where we came from. Under the vaulted dome of skies over a nameless continent, unhurried human existence passed its days here for thousands of years. The stone tools that took long days to perfect in such abundance suggest a rich living. So long after, we come by plane for a matter of weeks to this barren place littered with the artefacts of lives long gone and empty air where we imagine conversations, thoughts and hopes of people who shared all our genes. We leave again by plane taking with us insect specimens in bottles and on pins, information collected in files and notebooks, celluloid film recording the places and events, and exquisitely durable prehistoric artifacts and with them dreams of who we were before our world of electronic overload, reverberations of a past in which grinding patience and unrecorded ideas belied the future wilderness of a world enthralled with its own momentum and blind to risks of its own demise. Two months of work in the Sahel and we could tell a story. 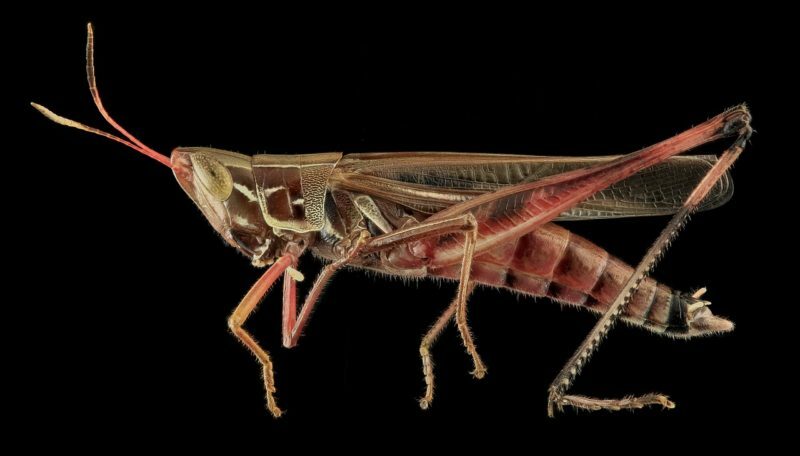 Several species of grasshoppers have acquired a migration pattern perfectly suited to making use of the rare and scattered patches of edible vegetation. They always fly downwind, whether they are north or south of the ATCZ. Individuals can sense the direction of the wind so that they always turn and fly with it, whether it is northerly or southerly, gaining speed that they would not have on their own. This inevitably brings them to the very limited, narrow region where rain is most likely to fall, allowing a bit of grass to grow and giving them the means to grow and reproduce there. They put on fat and mate. Then females develop eggs and lay them in the ground. If there is a little moisture in the sand the eggs will develop and the young hatch and grow in the same place. When a new generation is ready, individuals do the same thing that their parents did, flying downwind and giving them their best chances for passing on their genes. By then the ATCZ is again distant maybe north, maybe south, depending on the season. It turns out that the simple rules employed by these insects are remarkably effective at allowing them to find the little patches of vegetation in the Sahel. Two factors make it seem that they have come out of nowhere. First, they hide in the daytime down deep fissures in the terrain, giving the impression that nothing is there. Second, they accumulate suddenly in one place on the southerly and northerly winds that bring them from wherever were the last bests spot for them. Of course it seems like mysterious event when you visit such a place, but our work discovered the simple answers that have evolved for such success in such a place. Elizabeth Bernays grew up in Australia and became an entomologist in UK before becoming a professor at the University of California Berkeley. From there she became Regents’ Professor at the University of Arizona where she also obtained a Master of Fine Arts in creative writing.